Famously portrayed by Russell Crowe in A Beautiful Mind, this flawed genius was an award-winning movie waiting to happen. 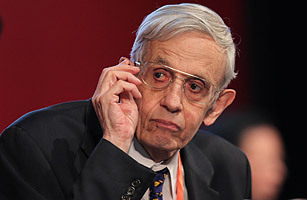 Demonstrating improbable brilliance from an early age, John Forbes Nash was eventually honored with the 1994 Nobel Prize for Economics for his work as a Princeton graduate student some 40 years prior. Though Nash had long been lauded for his economic contributions, his battle with schizophrenia as well as whisperings of alleged anti-Semitism made him a pick so controversial that the committee overhauled the selection process, including restricting selection-committee members to three-year terms rather than letting them serve indefinitely. In 2002, just before the Academy Awards, the anti-Semitic rumors resurfaced, but were quickly dismissed as gauche p.r. tactics from competing film studios and were brushed aside. Like Nash himself, A Beautiful Mind went on to win the top prize. Read "Inside the Oscar Wars."